I loved your blog post on imagery cues. I would like to know what cue’s you’d use for helping a client understand core awareness, disassociation of hips and lower extremities organization for both leg circles and side to side. Can you help? The best way I’ve found to help a client understand Core Awareness is drawing attention to it before, during and after movement. The only way for a person to begin to understand the concept of core awareness is through experiencing it in their own body. Know that this is a work in progress and different for every individual. Some people easily feel muscle activation and support while others may take years to become aware of how their body supports them. Know as well that body awareness can change in each individual day to day. Start by recognizing this in your own Pilates practice. Some days you are coordinated and in control, others not. Understand and communicate this to your clients. There is no right or wrong, better or worse. I do not use imagery until the end and many times not at all, I just draw attention to differences in how a client’s core support has changed as the movement cues are layered. I always add ‘Don’t worry if you can’t feel ….., we all feel things differently in our bodies’. I don’t want my client walking away sensing that he or she is not doing something ‘right’. My main goal for my clients is to stand and move with ease feeling better by session end then at the start. The fine-tuning of awareness happens when a client is ready for it. Only add a few ‘awareness’ cues per session and maybe only one if you see your client struggling with it. When building core awareness it’s best to suggest it in the simplest of terms. I’ve included a layered sample below, a foundation exercise used to increase core stability. With beginners only use layer one and two, with more advanced clientele combine Layer 1-2 into one cue and add from there. Remember once again there are no right or wrong answers to the core awareness questions below, everyone feels things differently in their bodies awareness will change with practise and time but the process is different for everyone. Quite often I’ll start a session or class standing asking a client or class how they feel in their feet, where the weight is, is it easy to stand up straight with ease. Is the weight balanced from side to side? Then we come down to the mat. We will stand up again after the chosen exercise to see if our standing posture has changed or ideally improved. On all 4s with a slight dip in the small of your back, align wrists under shoulders and knees under hips. Staying still in your torso lift left hand. Return hand to floor. Lift right hand. Do 2-4 times asking the client does this feel effortless? Did your torso move? (normal) How do your arms feel? Heavy? Light? Can you feel your abdominals working? Layer 3 – “When you lift your left hand do you feel your right side waist muscles turn on? “(obliques) Ask same question for the right hand (left side obliques). Be careful here, many people will feel the same side obliques turn on. The most ‘functional’ or optimal support is the opposite but often not the case for some people. Layer 4 – Imagery Cue – “Imagine two Xs crossing the front and back of body opposite shoulder to hip in the front, opposite shoulder to buttock in the back”. Lift left hand and return, lift right. “Do you now feel taller through your arms and legs, less strain in wrists, neck and low back?” “Did your abdominals turn on more?” You often see magical support in a client’s body with this image, a lift up and support through shoulders, better pelvic support. Depending on the level of your client(s) you can now move forward to arm reach, leg reach or opposite arm/leg reach, continuing on using the cue or image for core awareness/support that worked best for them. Sometimes the hand lifts are all they need. Do allow for modifications/rest for wrists. Return to standing. I then often say “if that exercise worked as I intended, you may now feel lifted through your torso, shoulders may be relaxed and you may feel grounded through your feet”. It doesn’t always work that way, so be prepared for different responses good and bad. I’d like to add that my favourite method for drawing awareness to core support is through the use of unstable apparatus. For example, neutral hip fold on a roller or balance cushion (under pelvis or 2 cushions, pelvis/ribs block supporting head) with both props no or little support from hands, does the job of drawing core awareness for you. The client feels the instability and their ‘core’ needs to stabilize/work or they will fall off! First add in deep core cues as above. See/feel the difference. Then add in an abdominal curl, they will quickly notice with the extra support of external abdominals they are significantly more stable in the hip fold. Lie in neutral alignment with legs wider than hip width. Bend knees and place feet on floor. Reach arms wide to a T shape. Inhale and Roll across pelvis and sway knees to left. Allow left buttock to get heavy and right buttock to lift. Keep shoulder heavy on floor. Inhale sway knees to right etc. Hold knees over to left. “Can you feel the lengthening down your right side?” (obliques)”Use these muscles to now pull your legs back to centre”, “Stay long in your torso as you do this” (sometimes you’ll see people hike hip). Continue back and forth using this cue. This time while your knees are to one side “Draw abdominals in and up. Widen contraction out towards hip bones. (TrA)”, use this contraction to help bring the knees back to centre”. As a beginner Pilates client I found leg circles very challenging as I could never keep my pelvis still nor move my thigh bone/femur effectively. Go figure that Pilates was initially recommended to me because of my terrible hip pain:). Building up to a leg circle with the below modifications and using a theraband slowly increased my awareness so that now 12 years later I can do fairly good Single Leg Circles, well most of the time:). With the assumption that your client does not know what hip disassociation is, this sequence with modifications and props will help them understand how leg circles can get the femur to rest more optimally in the socket which in turn releases muscle tension in the hips, allows our legs to move more freely in gait and increases our pelvic stability & core support. Start by lying on your back legs long, notice the contact of your legs to the floor, how does your low back feel? Do you have equal weight on both buttocks? Now bend legs, feet flat on the floor, do you have even weight across both buttocks (or sacrum)? Here you can choose to use a prop or not. The following prep and leg circles work well without a prop but if the client’s pelvis is unstable during the leg circles and the client doesn’t sense the movement a prop will draw attention to this faster. Keep legs neutral knees bent, knees line up with hip bones (ASIS), heels line up with sitz bones. Props: Place 2 small weight balls under pelvis one each in the middle of each buttock. (or one balance cushion under pelvis). Prep 1: Supine Pelvic Tilting, begins to increase hip mobility (pelvis moving around femurs disassociation) and allows the client to figure out where their ‘best’ neutral pelvis is. Prep 2: Supine Hip Fold knee flexed, pelvis stays neutral and still, Bring leg up to a 90 degree angle, thigh parallel to back wall, calf parallel to floor. Return foot to mat. Place right foot in a long theraband, toes covered, place elbows on the floor so that there is no strain in arms or shoulders while holding the theraband. For more hip support increase tension of theraband by tightening/shortening it. For less support (more core) release tension. Lift right leg towards ceiling (supine leg raise), lower leg back down towards floor. “Did your pelvis move on the weighted balls (or floor/ balance cushion), this time as you raise your leg only lift as high as you can keep pelvis still and not tuck your sitz bone. As you lower the leg down, did you arch your back? Keep ribs soft and lessen your range if your ribs pull away from the mat.” Continue lifting and lowering with precision, keeping base ribs heavy the pelvis still, and not rocking through torso. Extend right leg up to ceiling keeping neutral in pelvis, open right leg slightly to right, continue to arc leg out to the right and down towards floor, cross right leg over midline without losing neutral pelvic alignment, bring leg back up to the ceiling “Did the weight in your buttocks shift to the right buttock? Are you able to keep weight evenly distributed between both buttocks, if not, lessen the range of your circle” “Your range of your leg circle is when the pelvis can stay still, if the pelvis is rocking, it’s harder to target hip strength and mobility”. Watch that the client is not bracing with the opposite leg which has remained bent the entire time. “Can you keep the weight light on your left foot as you circle the right leg”. Place foot back on the right floor, remove theraband and props if used from under pelvis. Lie with both legs long. Ask sensory awareness questions. “Does your right leg feel different?” “Does it feel as if the leg is closer to the floor?” “Do you have more weight in that side of the pelvis?” “Does that leg feel longer? Shorter”. If the client feels these differences it usually means that the femur is sitting better in the socket with muscles at a more optimal balanced length. Repeat sequence on other side. At end see if both sides feel relaxed. When people stand up they may also feel that their shoulders have relaxed and they feel grounded in their feet, walking with ease. This sequence with props under pelvis also works very well on the reformer legs in straps and/or caddy or springboard springs. As body awareness increases advance to doing leg circles without the theraband. Also play with no prop under pelvis and have clients feel difference when an unstable prop is used. ** note hip mobility does not necessarily mean increased circle range, it means moving with ease directly in the hip socket, if you push the range of the thigh by moving the pelvic half, hip mobility is not increased rather lumbar spine mobility is increased which can contribute to lumbar instability and possibly producing back pain. Penny Kennedy is a Pilates Instructor who teaches at Therapeutic Pilates in Collingwood, ON. Her first introduction to Pilates was as a client at Body Harmonics 10 years ago. Within months she found relief from the chronic hip and neck pain that had plagued her for years. An active person who enjoyed hiking and swimming, Penny hated ‘exercise’ because she was uncoordinated and injured easily. Through the mindful movement training at BODY HARMONICS she discovered a way to become strong safely, her coordination, posture and confidence improved. She left a career in Television Production to become an instructor, BODY HARMONICS certified, and then became a member of the teaching staff. While at BODY HARMONICS, she taught in the Neurological program where she witnessed how cueing with imagery can help clients move with ease. 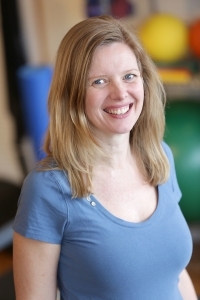 Now residing near Collingwood, Penny specializes in teaching people with chronic pain, new to exercise, pre and post rehab for hip, knee and spine surgeries, and those with joint hypermobility. Articles may be edited for length and clarity. Those published on Shoptalk remain the copyright of Body Harmonics. If you share Shoptalk articles with others, please credit Body Harmonics. Thank you! Thank you for this brilliant article. I am a Pilates teacher in Quebec and I found this article very useful. Would you have any suggestions and/or special exercices that address chronic knee pain due to a femero patellar syndrome and osteoarthritis? Pilates Q & A: Why can’t I do a Pilates rollup?